At home all the morning. At noon to the Wardrobe, and dined with my Lady, and after dinner staid long talking with her; then homeward, and in Lumbard Street was called out of a window by Alderman Backwell, where I went, and saluted his lady, a very pretty woman. Here was Mr. Creed, and it seems they have been under some disorder in fear of a fire at the next door, and had been removing their goods, but the fire was over before I came. Thence home, and with my wife and the two maids, and the boy, took boat and to Foxhall, where I had not been a great while. To the Old Spring Garden, and there walked long, and the wenches gathered pinks. Here we staid, and seeing that we could not have anything to eat, but very dear, and with long stay, we went forth again without any notice taken of us, and so we might have done if we had had anything. Thence to the New one, where I never was before, which much exceeds the other; and here we also walked, and the boy crept through the hedge and gathered abundance of roses, and, after a long walk, passed out of doors as we did in the other place, and here we had cakes and powdered beef1 and ale, and so home again by water with much pleasure. "Here we staid, and seeing that we could not have anything to eat, but very dear, and with long stay, we went forth again without any notice taken of us, and so we might have done if we had had anything." Anyone who hasn't had a similar modern experience, sign here. "29. A day of thanks for the Kings restoration in 60. I preached. from 1. Tim 2.1.2.3. the lord make his reign a blessing, and let not the lusts of men be satisfied on them"
"for that the Queen this day comes to Hampton Court"
Majesty in several rooms, according to their several qualifications." "they have been under some disorder in fear of a fire at the next door, and had been removing their goods"
"and the wenches gathered pinks"
What is Sam talking about here? Pinks are also known as Sweet William, or Dianthus. Thanks, Charlotte. Flowers of course - I was looking for dubious "non-floral" meanings and overlooked the obvious. "O Lord, our heavenly father, high and mighty, king of kings, lord of lords, the only ruler of Princes, who dost from thy throne behold all the dwellers upon earth; most heartily we beseech thee with thy favour to behold our most gracious Sovereign Lord King Charles; and so replensih him with the grace of thy Holy Spirit, that he may alway incline to thy will and walk in thy way: endue him plenteously with heavenly gifts, grant him in health and wealth long to live; strengthen him that he may vanquish and overcome all his enemies; and finally after this life, he may attain everlasting jopy and felicity, through Jesus Christ, our Lord. Amen". There was also in this Prayer Book (not removed until the 19th century) a "Form of Prayer with fasting to be used yearly upon the 30th of january, being the day of the Martyrdom of the blessed King Charles the First: to implore the mercy of God, that neither the guilt of that sacred and innocent blood, nor those other sins, by which God was provoked to deliver up both us and our King into the hands of cruel and unreasonable men, may at any time hereafter be visited upon us or our posterity." "A form of prayer with thanksgiving to Almighty God, for having put an end to the Great Rebellion, by the Restitution of the King and Royal family, and the Restoration of the Government after many years' interruption: which unspeakable mercies were wonderfully completed upon the 29th of May, in the year 1660; and in memory thereof, that day in every year is by Act of Parliament appointed to be for ever kept holy." Sam observes this as a holiday, but not a holy day - no visit to Church. Imprudent in a Govt. Officer?? For many ministers, saying all this would have stuck in their teeth. By August 24th, nearly 2000 ministers would have resigned their benefices because their consciences would not allow them to use the new prayer book. With Sam here taking everyone out on a jaunt, we see the melding of family and household - less rigidity than in, say, a 19th century household. Evolution: a few farthings in the pocket, can afford to go further than a hours shanks pony ride, an outing out of the normal, be normal. The entertainment were be like in the 30's in the UK. A walk in the park, where else? Minor note. Pinks and Sweet Williams are both forms of Dianthus, but most English people would assume that the word 'pink' referred to the common, simple pink rather than the multi-floret headed Sweet William. "and the boy crept through the hedge and gathered abundance of roses"
Now did he do this of his own accord, or by Sam's persuasion? Will we see a rose garden on the leads? Dirk Stoop (1610-1686) was a Dutch engraver and painter who recorded the arrival at Hampton Court, but I cannot find an example on the net. We have already seen his description of the procession on the Restoration. He joined the service of Catherine's father and accompanied her to London. 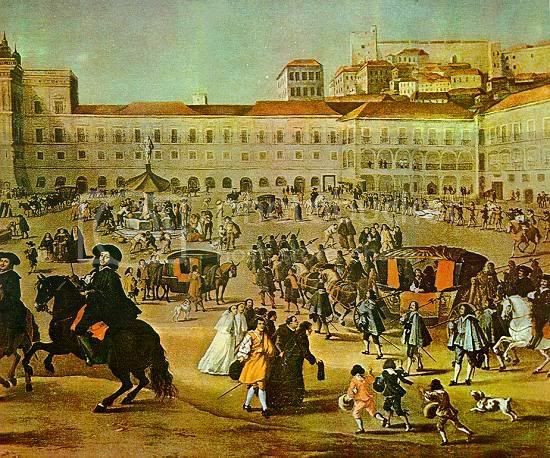 There are other engravings of the Palace in Lisbon, the departure from Lisbon, the arrival at Portsmouth, as well as many of Catherine herself. Alas, the only one I can find at the moment is that of the Palace. They should be at their peak soon!does anyone care to speculate what kind of "old" roses were they? The mention of a hedge makes one think of briar roses, but the lad would have needed stout gloves or horny hands if he was to gather those. More likely roses of the kind that we now refer to as Old English or 'cabbage' roses, with very full heads. He's making remarkably free with the blooms in a public garden, isn't he? Try that today and you'll have the park-keeper down on you like a ton of bricks. I think that these were also known as "Stinking Billy" in Scotland. "A Discousre Concerning Unlimited Submission and Non-Resistance to the Higher Power" preached by Johathan Mayhew, West Boston Church 1750:(Cahrles I)"upheld the monster of wickedness,ARCH-BISHOP LAUD,and the bishops of his stamp, in all their church-tyranny and diabolitical cruelities...Let us not profess ourselves vassals to the lawless pleasure of man on earth". John Adams sent Jefferson a copy of this text w/ the note: "I read it, till the Substance of it was incorporated into my Nature and indelibly engraved on my Memory". I took this from James Grant's discussion of religous underpinnings of our Revolution in "John Adams, Party of One" I'm currently reading. Jonathan Mayhew would not have been happy with the Book of Common Prayer! After the 13 Colonies became independent, one of the early acts to come about was the writing of a new Prayer Book for the new state - published in 1784, with no mention of praying for King George, let alone previous monarchs. They included prayers for rain and good harvest in ordinary prayers at Morning and Evening Prayer though - this was still a precarious existence even in the late 18th century. 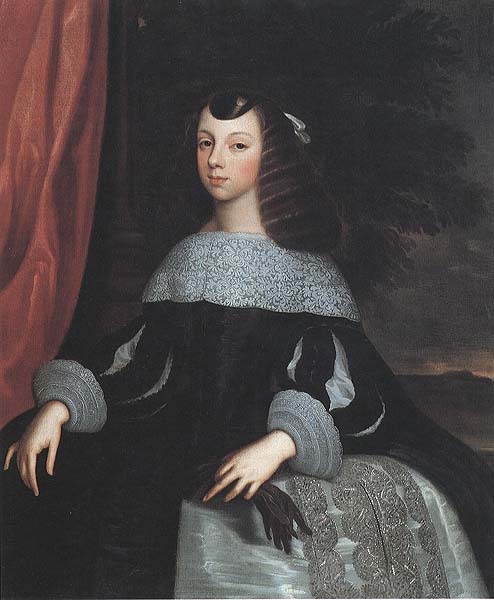 Catharina of Braganza, 1661, wearing a farthingale. Dirk Stoop entered King João IV's service in the 1650s, left with Catherine for Britain and remained with her until 1678, when 68 years old he returned to his native city of Utrecht in the Netherlands. Allin notes that it is Corpus Christi, with a great procession where the King and the Infante went afoot with much nobility and an army of friars. He could not get much done that day. The next day the King of Portugal asked him to take arms and ammunition to Oporto, and he obeyed the King's command. "In the evening, bonfires were made, but nothing to the great number that was heretofore at the burning of the Rump." ‘pink, n. A. I. 1.a. Any of various plants of the genus Dianthus (family Caryophyllaceae), which are typically low-growing with solitary flowers; spec. any of the numerous cultivated forms or hybrids of D. plumarius, with fragrant white or pink flowers, often with a dark centre or dark stripes or markings on the petals. Also: a flower or flowering stem of such a plant . . The distinction between pinks and carnations is often not entirely clear.